How Healthy Are Oatmeal Cookies? Oh, that sweet smell of soft, warm oatmeal cookies baking on a cool, fall afternoon. Or, perhaps you prefer dunking a crunchy one in a cold glass of milk on a hot summer day. Whatever your preference, you may wonder if that cookie you're devouring is nutritious. After all, oatmeal is supposed to lower cholesterol, right? Compared to chocolate chip, peanut butter and sugar cookies, oatmeal cookies are marginally more nutritious. 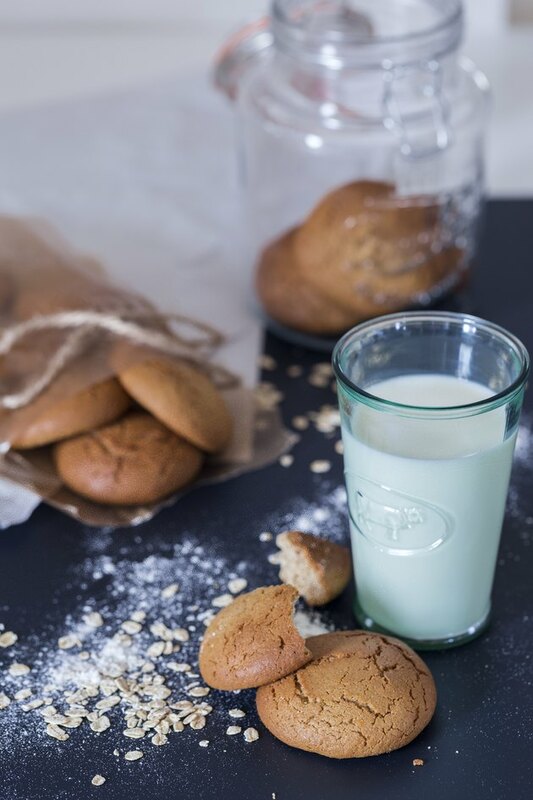 Comparing cookies of similar size, an oatmeal cookie has fewer calories than peanut butter or sugar cookies. Oatmeal cookies contain less fat and more protein, fiber and calcium than the others. However, all of these cookies contain between 54 and 72 calories; 2 and 3.5 grams of fat; 0.4 and 0.9 grams of protein; and 0.1 and 0.4 grams of fiber, so the differences are miniscule Oatmeal cookies do contain significantly more calcium, with 14 milligrams compared to 2 or 3 milligrams in the others; however, with the recommended dietary allowance for calcium of more than 1,000 milligrams, you'd have to eat a lot of oatmeal cookies to make a dent in your daily needs. Oats have several possible health benefits, including reducing asthma in young children, improving digestive health, improving insulin sensitivity, reducing the risk of diabetes, controlling blood pressure, improving heart health and even lowering cholesterol, according to the Whole Grains Council. Some oats are gluten-free so if you suffer from celiac disease or are gluten sensitive, oats can be a source of healthy grains. Eating them in a cookie -- although not the healthiest way to consume them -- can be an enjoyable way to include this nutritious grain in your diet. The great thing about oatmeal cookies is their versatility. Adding certain ingredients can improve the nutrition of your oatmeal cookie if you make them from scratch. Dried fruits such as raisins or cranberries will increase iron and potassium. Old-fashioned peanut butter increases protein and healthy fats. Chunks of dark chocolate add flavonoids and antioxidants, which may fight against heart disease. Adding ground flax seed or chia seeds increases healthy omega-3 fats. Wheat germ or bran cereal crumbs will increase fiber and other vitamins and minerals. Try substituting some of the white flour in your recipe for whole-wheat flour and reducing the sugar to make it even more nutritious. Even with healthy additions, an oatmeal cookie is still a cookie. Enjoying one occasionally is OK. They may contain more nutrients than other cookies, but they still contain large amounts of fat and sugar, which aren't so healthy and may be detrimental to your waistline. Are Oatmeal Raisin Cookies Healthy? Are Oatmeal Drinks Good for Losing Weight?